I was excited to learn that the very talented Chef Robert Angelilli will be handling the culinary side of Epic Brewing’s new gastro brewpub, called The Annex (1048 E. 2100 South, 801-906-0123). The new Sugar House pub will feature the entire range of more than 35 Epic beers paired with Angelilli’s cooking, and he promises an artisanal menu that’ll go far beyond the standard brewpub fish & chips. 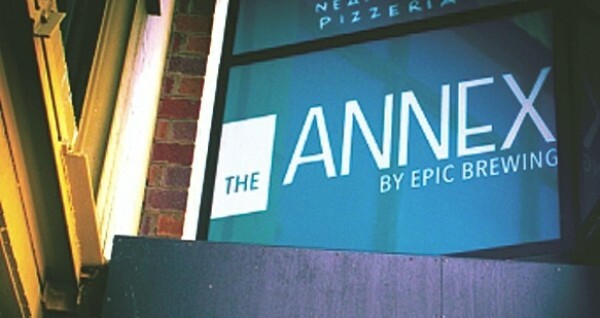 The Annex will be open for lunch, dinner and late-night fare. Follow The Annex by Epic Brewing on Facebook or visit EpicBrewing.com to stay up to date on construction and an opening date, planned for next month. Congratulations to The Roof restaurant (15 E. South Temple, 801-539-1911), which was the single Utah restaurant to be given an OpenTable 2013 Diners’ Choice Award for the “Top 100 Scenic View Restaurants in the United States.” According to OpenTable, the rewards reflect the “combined opinions of more than 5 million reviews … for more than 15,000 restaurants in all 50 states and the District of Columbia.” Located on the top level of the Joseph Smith Memorial Building at Temple Square, The Roof offers unending views of Salt Lake City and the Wasatch Front, combined with Chef Pedro Mauricio’s eclectic, internationally inspired all-you-can-eat buffet. The dessert selection is out of this world. Visit TempleSquareHospitality.com for more information. On Saturday, Aug. 24, from 3 to 7 p.m., The Homestead Resort in Midway will host Jamaican Jerk Fest. Don’t worry, this isn’t going to be a gathering of Caribbean a—holes; it’s a celebration of Jamaican jerk-style cooking featuring jerk grilled chicken, jerk pulled pork and more, including “authentic adult beverages.” The Patwa Reggae Band will set the musical tone for the day. Advance tickets are $25 for adults and $20 for kids 12 and under; tickets at the door will be $35 for adults and $20 for kids. These special Homestead events usually sell out, so advance tickets are highly recommended and can be purchased at ZermattResort.com/resort-events. Overnight room packages are also available.